Born in Kyoto in 1963, Tetsuo Takenaka became the third-generation proprietor of Seiwasou which was founded in 1957. After graduation, he worked for 3 years at Kyoto Tsuruya before coming to Seiwasou. Your time at Seiwasou starts from the moment you step through the gate. We take great pride in giving attention to every detail from the cuisine, architecture, design, garden, and service, including the warm welcoming ambience. Each guest’s comfort is paramount, and we do our best so that diners can slowly enjoy their time at Seiwasou. You can find me frequently at the counter personally deep-frying tempura for guests the counter. It is my sincere hope that guests leave with a smile on their face, and precious memories they can treasure. Seiwasou’s intimate seven-seat tempura counter is the perfect place to enjoy the changing colors and the picturesque views of our garden throughout the year. The tempura at Seiwasou is distinct and different from the tempura in Tokyo or even the Kansai area. 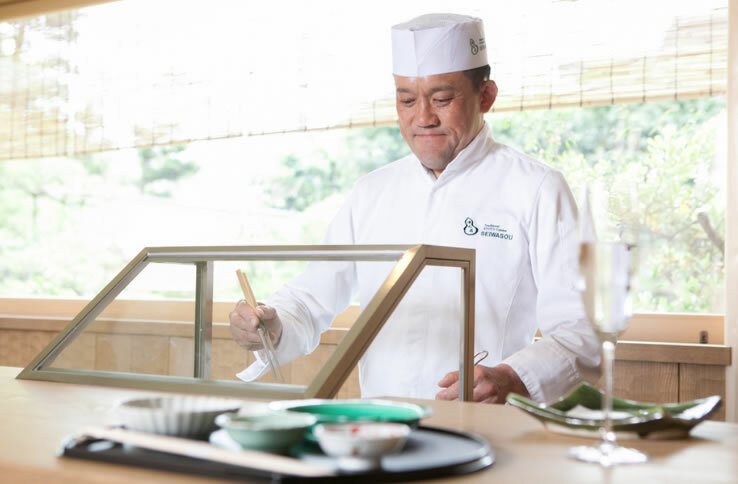 The owner personally carefully selects the finest healthy seasonal ingredients such as crispy prawn, seafood and seasonal Kyoyasai (Kyoto heirloom vegetables) to be deep-fried in Seiwasou’s special healthy blend of Cottonseed oil and rich aromatic Taiko Sesame oil. An extensive array of fine sake from Fushimi, as well as a wide variety of champagne and wine are available to be the perfect complement to your meal. 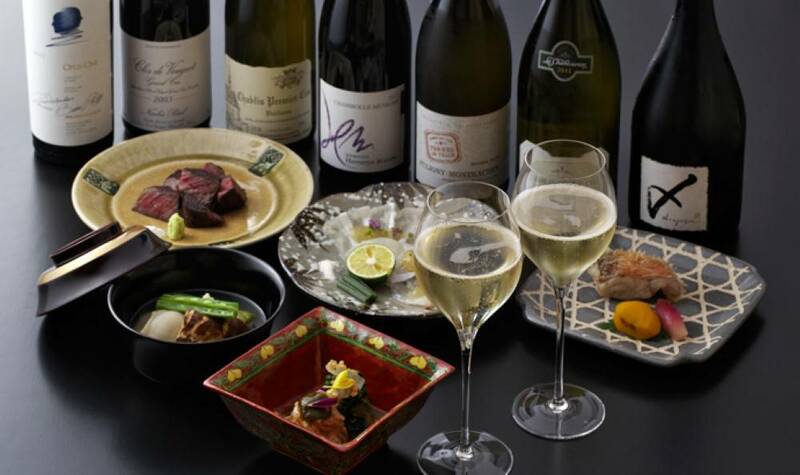 At Seiwasou guests can enjoy authentic Japanese cuisine along with the perfect wine to go with their meal. The cuisine of Seiwasou from "Fushimi"
In Kyoto, Fushimi was once called “Fushimizu”, because it is abundantly blessed with pure and clean underground water. Seiwasou’s dashi or soup stock is made from this pure spring water, along with some of the finest ingredients found, such as natural kelp from Rishiri in Hokkaido and premium “true dried fillet”, katsuobushi which has been repeatedly sun-dried for more flavor and taste. 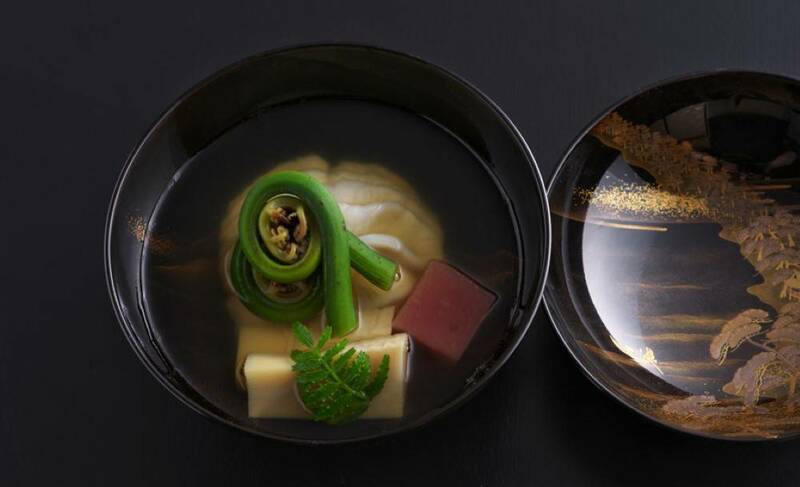 “Ushio-jiru”, a clear seafood-based soup and “joujin-dashi” stock bring life to the dishes. Seiwasou locally sources certified heirloom vegetables “Kyo-Yasai” from neighboring farms and obtains the finest seafood and fresh ingredients procured locally as well as from around Japan. The chefs at Seiwasou use their expertise to use the fresh vegetables, seafood and stock to create the delectable taste and aroma of Seiwasou’s cuisine. Seiwasou’s cuisine upholds the traditions of Japanese culinary arts, while integrating modern cooking techniques and ideas into its cuisine, with an aim to keep the essence and legacy of “Kyoto Cuisine” alive for generations to come.